From the beginning of its existence until 1931 when it was allocated for museum purposes, the Town Hall was a building where town officials were residing. Built at the turn of the 16th century as a Gothic, brick building, it was altered in the 70s of the 16th century and gained a Renaissance look. This simple, cubic building was then crowned with a high, brick wall of an attic, behind which there was the so called butterfly roof. 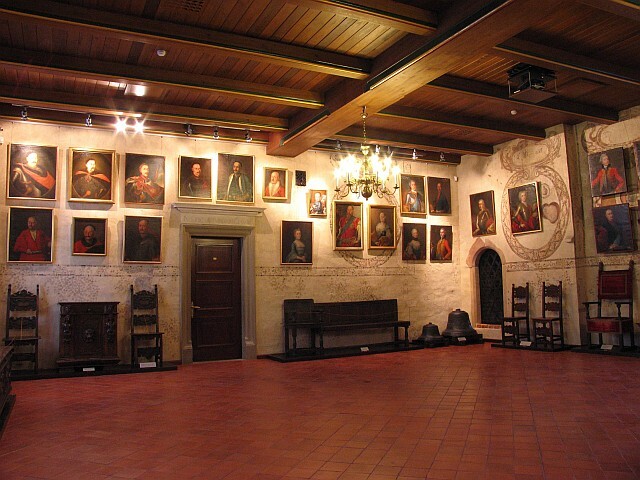 This attic was decorated with 28 blind windows, in which there were portrays of town owners from the Tarnowski family. The most decorative element of the attic – the top was decorated with pinnacles and mascarons combined with double volutes. At that time, from the southern side, an avant-corps was added with an elegant, external portal where the Leliwa coat of arms was placed. The following letters were placed on the heraldic shield: T C V C – TARNOVIAE CIVITATIS VERA CLENODIUM – LOYAL JEWEL OF TARNÓW TOWN. The entablature of this portal is decorated with the following sentence: DOMINUS CUSTODIAT INTROITUM EX EXITUM TUUM – MAY THE LORD GUARD YOUR COMING AND YOUR GOING. During the renovation in 1889-1892 carried out by an architect, Szczęsny Zaremba, the interiors underwent major changes involving the demolition of their damaged vaults. On the first floor, the Council’s Room was expanded and decorated with neo-Renaissance stucco which gave it an elegant character. The entrance to this Room is decorated with a Renaissance portal, the header of which bears the following inscription: JUSTITIAE FUNDAMENTUM FIDES – THE FOUNDATION OF JUSTICE IS FAITH. During the restoration of this building in 1962-1968 carried out by J. E. Dutkiewicz, on the walls in the Commoners Room (pl. 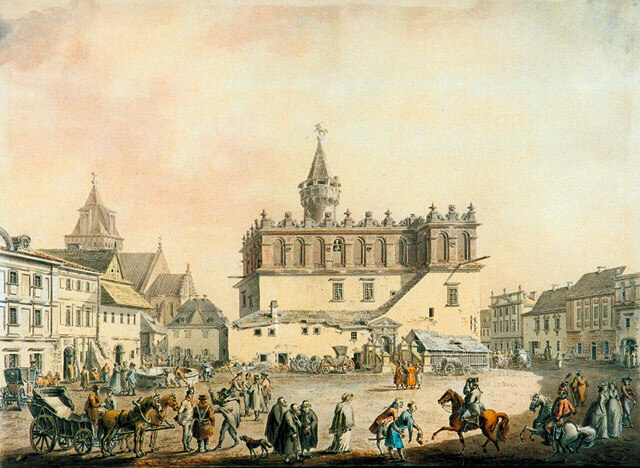 Sala Pospólstwa), fragments of polychromy dating back to the 18th century were found, modelled on the illustrations in the work of F. Pona “Cordiomorphoseos sive ex corde desumpta emblemata sacra” of 1645. This Italian original was used here in order to present the civic values of the town council. The tower – Gothic-Renaissance structure 28 m high. On its top, there is a porch which used to be the place for the fire guards who were to raise the alarm if there was a fire. Initially, the dome of the tower was crowned with the town’s coat of arms – Leliwa. It was replaced with the Pogoń coat of arms, visible till this day, the coat of arms of the Sanguszko Dukes, the heirs of Tarnów since the 18th century. 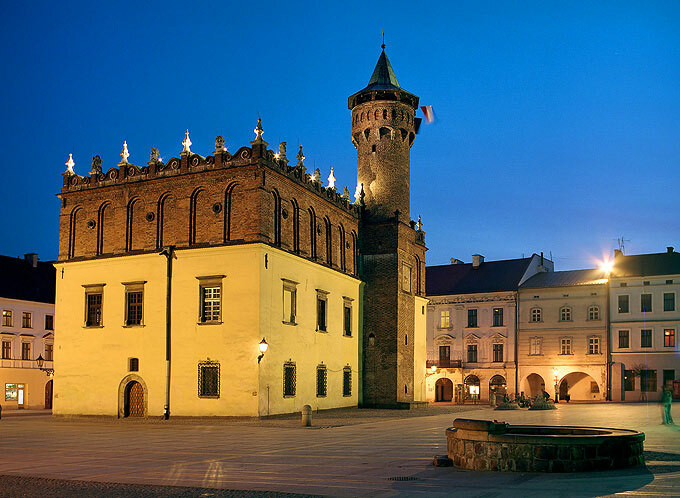 At noon, there is a trumpet call played on this tower, composed by Stanisław Rzepecki in 1972. 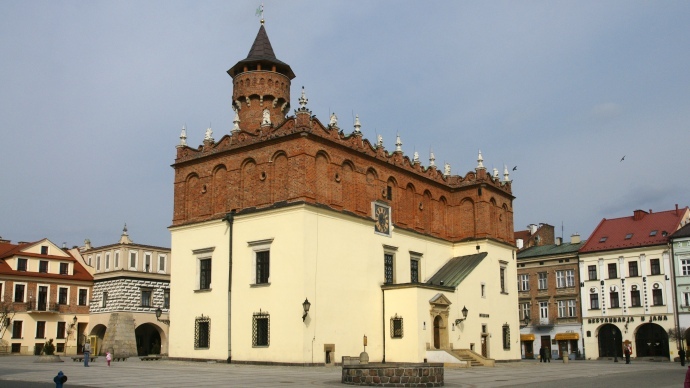 One of tourist attractions is the possibility of entering the tower and admiring the view of Tarnów. The clock. The oldest information about the existence of this tower clock dates back to the beginning of the 16th century, it was destroyed during the fire in 1663. The parts remaining after this clock are two clock bells that are currently exhibited in the Commoners Room. This destroyed clock was replaced with a new one that operates until today and is one of the oldest operating tower clocks in Małopolska. Note: the rooms inside the Town Hall are available for the deaf.